Comments Off on Schmalz Cup Update! The final four for the Schmalz Cup was set today as the Alliston Hornets completed a come from behind 3-0 in games, to win their series against the Walkerton Hawks 4 games to 3. Alliston Hornets will play the Port Hope Panthers and the Essex 73’s square off against the Ayr Centennials. You can follow the games on the Schmalz Cup link on the Bruins home page. Good luck to all the remaining teams. Comments Off on Bruins Season over in 6-4 Loss! Bruins Season over in 6-4 Loss! 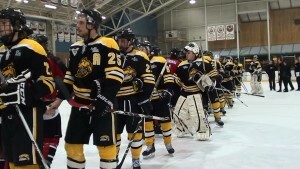 The end of the road came tonight for the Uxbridge Bruins as they fell 6-4 to the Clarington Eagles and 4 straight in the Central Ontario Finals. Todd Winder (2) Jarett Smith and Tyson Eastgate scored for Uxbridge in their final game of the season. Thank you Fans for your support during the season and the playoffs. Congratulations to the Eagles and continued success at the Provincials. Comments Off on Game 3 OT Loss for the Bruins! Game 3 OT Loss for the Bruins! Uxbridge loses a close game 3-2 in OT to Clarington and now trail the series 3 games to none. Scoring for Uxbridge were Daryl Thomson and Alex Siblock. Game 4 is Sun. Mar.8th in Clarington at 6:50pm. Game 5 if necessary is Tues Mar.10th at 7:45pm in Uxbridge. Despite two goals by Carter Vahey, the Bruins ended up losing 3-2 tonight in Clarington to fall behind 2-0 in the Central Finals. Next game is Fri, Mar.6th at 7:45pm at the Bear Den. After a scoreless first period the Clarington Eagles took a 1-0 lead into the second intermission tonight in game 1 of the Central Finals, but Shane Smith would tie it up at the 5:10 mark of the third where it would stay that way until the second OT period when the Eagles scored. N ext game is Wed Mar.4th in Clarington at 7:20pm and game 3 is Fri Mar.6th at 7:45pm in Uxbridge.